 Home › Unlabelled › Okorocha Replies Oshiomhole: You're Father Of Nepotism With Family Members In Govt. 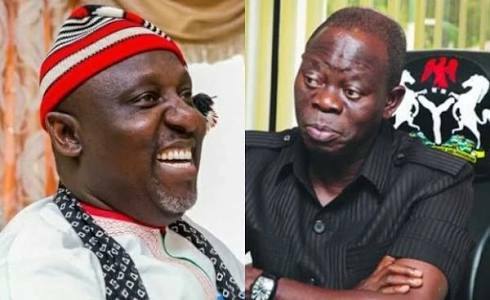 Okorocha Replies Oshiomhole: You're Father Of Nepotism With Family Members In Govt. Imo State, by insisting on his son-in-law Uche Nwosu as the All Progressives Congress (APC) candidate in Imo State, as the young man won the primary election. Okorocha said Oshiomhole is chief of nepotism in office. The governor in a statement signed by his Chief Press Secretary Sam Onwuemeodo explained how Nwosu won the primaries, yet Oshiomhole has listed Senator Hope Uzodinma as the APC candidate. He said: “Adams Oshiomhole led National Working Committee (NWC) sent a 12-member Committee to Imo State to conduct the APC primaries with Alhaji Ahmed Gulak as Chairman. The primary elections were slated for October 1, 2018. Because the Committee members arrived late, and after all said and done, he announced that the primary would then take place the following day being October 2, 2018. “Alhaji Gulak didn’t wait to Conduct the primaries. He fled Owerri. And he told the world that he fled Owerri by 4:30am because there was kidnap attempt on his person. The Secretary of the Committee Barr. Henry Idahagbon from Edo State with seven other members who stayed behind went ahead with the primaries and Uche Nwosu won the governorship primary. “However, Comrade Oshiomhole told Nigerians that he had disbanded the Gulak committee and discarded all that came out from that committee and promised to set up a new one. In line with his promise, he set up another 13-member Committee led by Brigadier-General Ibrahim Agbabiaka. “October 6, 2018, the Agbabiaka Committee Conducted the primaries and Uche Nwosu won that of governorship. The Prof. Osunbor Appeal Panel also looked at the whole scenarios and also declared Uche Nwosu Candidate of the party. These are our narratives. Let Adams Oshiomhole or Gulak contradict us. “All of a sudden, the same Oshiomhole who disbanded the Gulak Committee and whatever came out of it, developed strange love for Gulak and his blunder. That is the crux of the matter in the Imo APC case”. Okorocha described Oshiomhole as a builder of dynasty. He named people he referred to as the chairman’s family members in positions or APC candidates in Edo State.